One-sentence summary: A war-scarred governess finds her new charge is touched by the fey -- fairies -- and working with her unleashes demons from her past and new challenges. Do I like the cover? : I was sort of 'whatever' about it initially, but while reading, I realized it is from a specific scene in the novel and that made me happy. Now I like how flashy and slinky and pretty it is! First line: The moor was grey, battlefield grey. Buy, Borrow, or Avoid? : Borrow or buy if you like techno-fantasy, governesses in love with their employers, and the world of fey. Why did I get this book? : The cover - so flashy! Review: I missed in the early pub info that this was a send up/re-imagination of Jane Eyre, making this the third such book I've read this year! While it has nods toward Bronte's classic -- most notably the romance between governess Jane and her employer Edward Rochart -- the novel isn't strictly a Jane Eyre retelling. Jane Eliot moves to a rural estate to act as a governess to a girl born during the Great War. The Great War, fought between humans and fey, left the world in shambles and Jane scarred by a fey weapon that requires her to wear half an iron mask. Her employer, Edward Rochart, is handsome and mysterious, apt to disappear without a word, who wanders in the dangerous woods now and then, and keeps company with the country's richest and prettiest women. But parts of the house are forbidden to Jane, as is the truth of Edward's past, and Jane is curious about both. Stuff happens -- stuff totally unrelated to Jane Eyre and stuff closely related to it -- and by the novel's explosively odd end, I was pretty satisfied. In terms of romance, this one was 'eh' for me. I don't get the appeal of the Rochester archetype, but then again, I'm not a fan of the Byronic hero, so in that sense, the romance between Jane and Edward was wasted on me. The does-he-love me schtick, while authentic perhaps to the original novel, made me impatient. It was the odd note in Jane's otherwise rather strong and sensible disposition. I was most intrigued by Connolly's toying around with the vaunted concepts of 'beauty' and 'anger' in this book. Women are often told not to mix with anger; literature is full of women struggling to tamp down their strong feelings. In this case, Jane literally has to struggle to control her rage -- it's part of her 'fey curse', a lingering wound from a fey bomb, causing unceasing rage to radiate from her face, impacting her and infecting those who are around her. While Jane has to tame her rage -- in the form of her 'ironskin' mask, which dampens the effects -- she also comes to learn to work with it, and in time, her rage proves an essential element to her success. I rather appreciated that. I am very curious for the sequel -- I was surprised by the novel's end and some of Jane's choices -- and I'm very interested in seeing where Connolly takes Jane and her fey world. I'm thrilled to offer a copy of Ironskin to one lucky reader! To enter, fill out this brief form. Open to US/Canadian readers, ends 10/19. 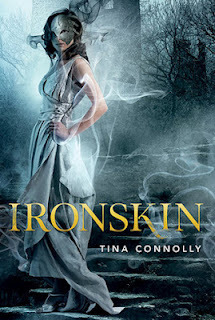 Be sure to check out my interview with Tina Connolly for another chance to enter! You would LOVE this one, I think -- really your speed! I must admit I would have never guessed from the title or cover that this was a take off of Jane Eyre. It sounds like fun! I'm glad I learned that because I was getting all huffy while reading it -- and after my fiasco with Charlotte Markham... I started to wonder if I've suddenly become unable to read fiction about governesses -- but very quickly I was charmed by the novel and the non-JE portions. Love the cover! Kind of gothic, and looks like a sort of masquerade thing. I love Jane Eyre so a retelling, if not complete retelling sounds my cup of tea! Interesting, in that way, to have a sequel. Interestingly enough, there is a theme with masks throughout the story although not in the way you might expect! Have you read Margot Livesey's take on JE? Something Gemma Hardy -- soooo good. Marvelous. V different from this one, but equally fun. I can't read the rest because I'm sort of working on this now and don't want to steal your analysis. But, yeah, you made me laugh in just the preliminaries. Woo! :) I can't wait to see what you think -- initially I was put off by the JE thing and couldn't shake it but as I read on, the story worked -- and I hope Connolly's next book is more original as I like Jane and her situation! This book would be waaaay out of my comfort zone but I kind of like the sound of it! Sam, this might be a good one to start with as the fantasy elements are pretty light -- which is what I need, I get all cross eyed at too many monsters/creatures/mythical world-building -- plus light on the science-y -- another perk -- with the Gothic/Eyre frame to draw one in... The writing is lovely, reads very fast, and it's pretty diverting! I have not read Jane Eyre, but this sounds interesting. I think I can avoid the love relationship as something to draw me in, but I think there is enough here for me. This one definitely sounds like a fun read! I wouldn't have guessed the Jane Eyre connection from the cover. I'm glad to know that the cover makes sense - I love it when the cover art complements or clearly represents parts of the story inside!